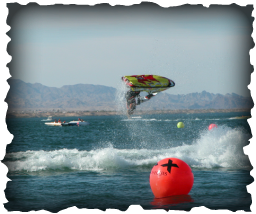 Jet Ski Parts & Accessories mega store with aftermarket performance jetski parts and ski accessories to help the do it your-selfers get the job done. Our Jets Ski Parts staff is very knowledgeable with 26yrs experience in personal watercraft jet skis and will be glad to answer any tech question you have. Our Jet Ski part website sells ski parts for Kawasaki Yamaha Polaris Sea Doo Honda and (PWC) personal watercraft. We also carry Jet Boat parts. Be sure to see our Jet Ski Daily sales! Jet Ski story started back in 1989 when a buddy of mine mentioned he wanted to do a river trip for labor day weekend. I said lets go and his response "yah but my jet ski's are broke". I had no idea what a Jet Ski was at that time. But, I was a Pro race car driver and mechanic plus, I road dirt bikes and thought how hard could it be to fix. I told My bud David, Let me take a look at them. Wahlah, 2hr's later a new starter for the 85 JS550, new spark plugs and gas for the 86 JS 550 Jet Ski and we where on our way to the Parker Strip on the Colorado River. One of my favorite trips. I was Hooked. I got a job at a local Yamaha dealer and started racing jet ski's. That lasted about 6months as I caught the eye of another watercraft shop owner who brought me in to run the Kawasaki Jet Ski and Yamaha Wave Runner side of Shop. The shop exploded and we were one of the top race teams at all the races. I then was asked by many when I was going to open my own shop and in 1994 I took the leap of shop owner. This was very satisfying . I was able run the show, race, and sponsor other racers. BTW: We use the safest payment service for maximum security for your online jetski parts purchases. We help protect you and us from fraud.